Vancouver, BC – A new June 6, 2018, short video feature from NewsInsideOut reporter Jon Kelly titled “UFO Zoomorphology: The Avian Motif” explores how some unidentified flying objects resemble animal forms when imaged in 0 Lux infrared with a tripod-mounted 3CCD broadcast-series camera. In the video, images from Mt. Adams, Washington, recorded during the summer of 2010 reveal luminous emissions in the woods followed by a UFO that travels below the forest canopy. Digital video editing reveals the head of a bald eagle in profile recorded in one of the frames. According to the witness, appearances of forest lights could be interpreted as precursors to the major UFO illumination event that followed. While studying the images a notion concerning plasma boiling in the atmosphere arises suggesting a scenario related to the churning on the surface of an ocean prior to the emergence of an entity from beneath the waves. The sequence of images shown in the video represent events that occurred within a two-minute window of time while the camera was stationary and mounted on a tripod. The videographer relates how “During the recording period I was walking along the forested roadway in front of the camera directly beneath where the UFO flared. It produced a blue aura that illuminated the canopy like special effects lighting used in science fiction film-making. 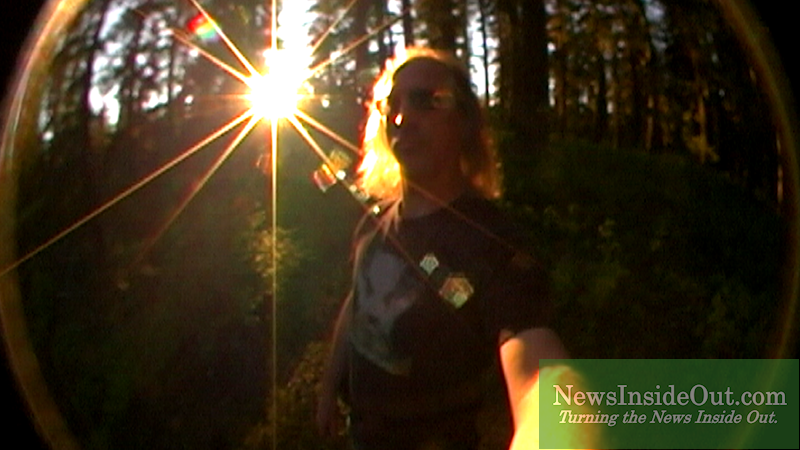 Discontinuities of light emissions seen in the video suggest how the UFO was flying behind some of the trees and that the source of illumination was within the woods that separated the lens from the subject. If the light had been projected from behind the camera while sweeping a trail upon the woods it seems the continuity of that trail would have been greater. This conclusion is based upon an idea of how from the camera’s perspective there would have been little to no obstruction of the illuminator’s beam between its reflection off of the trees and the lens. 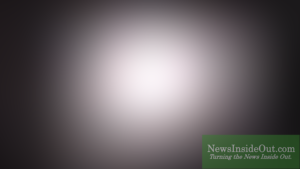 Vancouver, BC – Exclusive new video from Canadian skywatcher Charles Lamoureux reveals the flight of an orange orb over the Yaletown district of Vancouver, British Columbia, Canada, said to have taken place on the night of June 3, 2016. 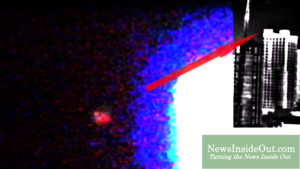 The object remained invisible to one far infrared thermal imager but registered in near infrared using a color night vision camera mounted in a custom multi-instrumental optical data-collecting array. The absence of any detectable thermal signature reportedly disqualifies known causes including balloons and waterfowl in a case where acceleration/deceleration and 180-degree course-changing behavior are abundantly evident. Registration of a bird in flight using thermal imager. Color-Stable UFO Under City Lights. Amidst omnidirectional light beaming from potentially hundreds of city sources including high-rise windows, bright reflective surfaces on buildings and street lights below the orange orb in the video retains color stability throughout the period of observation. The simplest explanation for such an effect involves a subject that is self-luminous emitting its own light into the environment. That the video could be a hoax suggests tracking moving reflective subjects with powerful spotlights equipped with orange gels stationed on adjoining balconies and the street below. This irrational hypothesis imagines a crew of co-conspirators in an industrial-scale operation where the budget for camera equipment for this shot totals under $2,000.00. Charles Lamoureux uses the Luna Optics LN-DM50-HRSD color night vision camera with starlight sensitivity of 0.03 Lux. Luna Optics has emerged as a leading vendor in budget color night vision for entry-level users. Based upon user reports over several years it seems that serious skywatchers will want to consider purchasing two units of this model in order to have a redundant backup (in case of device failure while in-use). While such a strategy eliminates the budget aura surrounding this product for a few dollars more it is said that the highly-rated and reliable Pulsar Recon X870 monocular is still available through major retailers in North America. Pulsar X-series devices are built to industrial workplace standards and have been responsible for significant Pacific Northwest UFO documentation over the past five years under intensive (more than 100 hours per season) field use. The Lamoureux family is said to have been photographing UFOs in Vancouver, British Columbia, Canada, since as early as 1937. Canadians have been photographing orange orbs since at least as early as 1970, as revealed in this example from Tagish Lake in the Yukon Territories. Vancouver, BC – Secret messages concerning three United States presidents were published to NewsInsideOut Plus on May 11, 2015. An exclusive new video explores Sasquatch contact in British Columbia, a sleep-walking exorcist in a haunted house, Spiritual Psychology of UFO Contact and secret messages of the UFO Contactees. The special video edition of UFO Classified with Erica Lukes originally aired this past Friday had been rejected by one of the top-ranked social media websites in the world. It is a move that furthers crystallization of the necessity for public support of private label distribution providing leading-edge content secure from the editorial reach of an increasingly censorious social media. A previous interview hosted by Erica Lukes for UFO Audit continues to stream over YouTube. The difference between the two broadcasts? A generous inclusion of secret messages for UFO Classified that were not aired or included in the UFO Audit archive currently hosted by the number two website in the world. If prior published records are any indication, the internationally-acclaimed analyst has a track record for identifying secret information before it becomes a matter of widespread public knowledge. NewsInsideOut.com coverage has described how the same procedure followed in detecting the secret messages of Presidents Jimmy Carter and G.W. Bush aired during the broadcast publicly revealed details of the Iraq War, identified the BTK Killer, named Russian spy Anna Chapman’s accomplice and uncovered the UFOs and ETs in Edward Snowden’s NSA cache weeks, months and years before these details were confirmed by the mainstream press. Regarding suitability for publication the procedures, materials and testimony presented had been vetted by major terrestrial media throughout and beyond the English-speaking world for over 15 years prior on three continents. The original broadcast of UFO Classified with Erica Lukes for May 6, 2016, is also available as a free MP3 stream via the KCORRadio.com website. NewsInsideOut Plus is for readers who support our journalism and want to deepen their connection with “Inside-Out” reporting. For $7 per month or $70 per year, a richer NewsInsideOut experience awaits. Receive exclusive access to mini-documentaries like “Marfa Reflections” and “UFO Mountain,” behind-the-scenes reporting and more. With your subscription you will be able to unlock the latest NewsInsideOut Plus content. Subscribe early to ensure you don’t miss any of the excitement.